Last year, I had surgery on both feet to correct some issues with my toes caused by Charcot Marie Tooth disease. Six of my toes were fused at the last joint, and two toes were removed completely (yes, ick.) But let’s not get hung up on that. 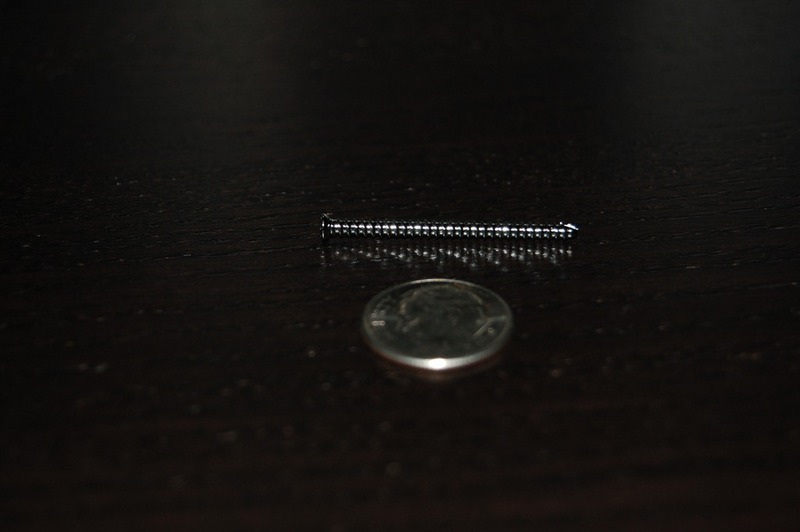 One of the results of this surgery is that I was left with threaded titanium pins in six of my toes… one and a quarter inch long screws meant to keep the toes permanently straight, even if the effects of CMT continue to try to bend them into little question marks. A few months ago, I started getting some discomfort from one of those toes. I thought I had developed a corn or a callous or something on the tip of my toe that just wouldn’t go away. Again, ick. Yesterday, I finally went the local podiatrist to see what was really going on. He checked the toe. It’s never a good sign when your podiatrist says “Hmmm. That’s not good.” We did a quick set of x-rays to confirm his diagnosis. Unfortunately, one of the pins had started to back out of my toe… that is, it was working its way through the tip of my toe, and was quite close to coming out altogether. This would be really bad, as it’s a direct path for infection to reach the bone, and it has to be dealt with, and immediately. This isn’t unheard of, and is a relatively quick procedure (about 10 minutes) to rectify, if you have the proper tools. What we needed was a special screw driver, and my podiatrist’s office didn’t have one that size. But the local hospital does have the correct screw driver, and my podiatrist was headed over there yesterday afternoon to do another procedure. He could have me in and out in 15 minutes. No big deal. But there was a catch. There is always a catch. You see, hospitals have policies, and those policies have to be followed. No matter what. The hospital called me for a full medical background yesterday, during which time I had to tell them all about my stay in the very same hospital 8 months ago for my GBS. The anesthesiologist called me yesterday to reconfirm the information gathered an hour before. I had to fast for 8 hours before the appointment. Fasting makes me grumpy. My wife had to take the morning off work to drive me to and from the hospital because I can’t be trusted to do it on my own after any procedure. I had to show up at 8:15 AM for a 9:15 AM procedure. I had to review all my medical history (again) with the nurse checking me in, and again with the anesthesiologist. I had to completely change out of my clothes and into a hospital gown for the procedure. An anesthesiologist had to be present for the procedure, even though the only thing I would be getting would be a local anesthesia affecting one toe. In fact, I had to tell them that I didn’t need or want an IV or a sedative for the procedure—that the local was enough. The procedure itself took 10 minutes. I felt more pain from them removing the tape holding the surgical shield to my leg, than I did from the pin extraction. I spent half an hour in the recovery room, even though I was awake and fine the whole time. Now, I’m not saying that I don’t appreciate nice, sterile environments for surgeries, but if you want any indication as to why medical costs are soaring in the United States, this complicated process is probably reason number one. All for the want of a screwdriver. And the offending screw… it’s pictured below. That’s quite the story. Risk management reigns supreme! Hi Vanessa, sorry to hear about your husband’s issues. If you haven’t contacted the CMTA (cmtausa.org) I’d start there. They can give you all kinds of information on doctors and clinics in your area. I know a good one in the Seattle area if you are close. My father had an ankle fusion back in the 1980’s and it went horrible wrong (with a bone infection), and I hope to never have to have one. Not sure what other advice I can give you, except that you absolutely should get another opinion and find a doctor you feel comfortable with. Don’t worry about hurting their feelings. You need to take care of your family, first, Good luck.